It has long been held that the regulation of photosynthesis in source leaves may be controlled by carbohydrates. The mechanisms that govern the diurnal fluctuation of photosynthesis and the potential role of feedback regulation by carbohydrates during photosynthesis in coffee (Coffea arabica) leaves were investigated in three independent and complementary experiments. An integrative approach using gas exchange measurements in addition to carbon isotope labelling and steady-state carbohydrate and amino acid analysis was performed. Canonical correlation analysis was also performed. In field-grown plants under naturally fluctuating environmental conditions (Experiment I), the overall pattern of gas exchange was characterised by both low stomatal conductance (g s) and net carbon assimilation rate (A) in the afternoon; no apparent signs of photoinhibition were observed. Under conditions of low air evaporative demand (Experiment II), only slight decreases (~20%) in A were observed at the end of the day, which were associated with a reduction (~35%) in g s. For both conditions, any increase in carbohydrate and amino acid pools over the course of the day was small. In leaves from girdled branches (Experiment III), a remarkable decrease in A and particularly in g s was observed, as were increases in starch but not in hexoses and sucrose pools. Furthermore, the rate of 14CO2 uptake (assessed under saturating CO2 conditions) and the partitioning of recently fixed 14C were not affected by girdling. 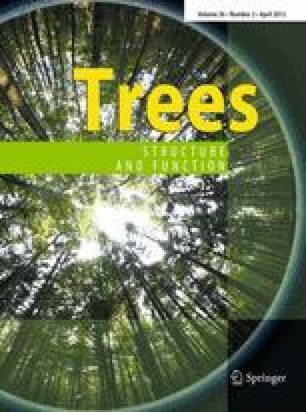 It is proposed that the diurnal oscillations in A and the differences in A in leaves from girdled and non-girdled branches were merely a consequence of diffusive limitations rather than from photochemical constraints or direct metabolite-mediated down-regulation of photosynthesis. This work was supported by the Foundation for Research Assistance of the Minas Gerais State, Brazil [grant number CAG APQ-3995-3.08/7], and by the National Council for Scientific and Technological Development, CNPq [grant number 301313/2007-5]. Scholarships were provided by the Brazilian Federal Agency for Support and Evaluation of Graduate Education (K.D. Batista) and by CNPq (W.L. Araújo, W.C. Antunes, P.C. Cavatte, G.A.B.K. Moraes, and S.C.V. Martins).